Cee posts a Share Your World every week where she asks four questions and you answer them on your blog. I have seen Sheena and Kim post them today, and it made think of an I saw a year or so ago and it made me laugh, so I thought I would share with you all. This entry was posted in Internet and tagged Books, Funny, Humor, Humour, Life, Phobia, September. Bookmark the permalink. ← Life Is Not Perfect, And Anyone Waiting For Perfection Would Wait For Eternity! I’d love to see this book! Maybe seeing them pop up in a book would defuse their power to pop up in my life. Hahaha. Thank you for sharing this image! My mind went to all my phobias popping up in a book – and I LOVE pop-up books. BUT – oh my, it is freaky to think about…….. It makes me smile every time I see the book. I wonder if it does exist. If it does, I will have to see about buying it. Thanks for the laugh, Al! 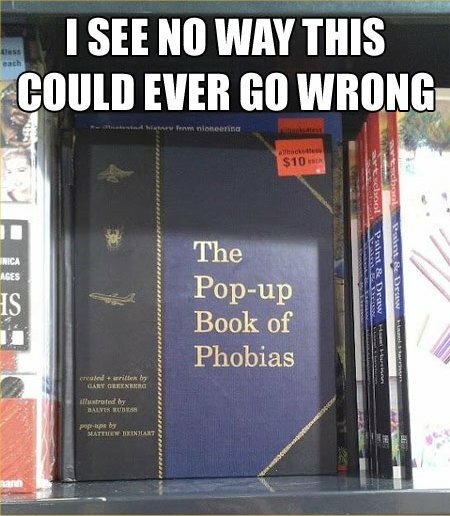 I can just imagine this book with spiders in it! Lol Lauren that may be creepy. Our spiders are ugly but not threatening. They do bite though. Well think of pretty flowers on the bank of a calm lake. The sun shimmering gently with the ripples. Frogs croaking, crickets scratching, birds singing and in the distance children laughing. 🙂 good night. I will, thank you, my friend! You are awesome! 🙂 Sleep well! Someone I know got out the shower and found one on her head. My daughter freaked the other day because there was a huge spider in her room. SO I went and grabbed it and she ran away from me as I was coming out of her room. Do you realize how brilliant this is? Let’s say you are are afraid of clowns…unless they happen to be in the first pop-up pages, then the anticipation builds with each turn until OHMYGODCLOWNS!!!!!!! Sorry. I may be a little weird after work today. And no, I am not afraid of clowns, but I apologize to anyone I freaked out with that. My daughter use to scared of clowns. She use to ride the bus where the clown agency was and had to quit because the clowns use to getnon the bus. She got over it. Poor girl. I can see why that was a problem.